Picture 11, originally uploaded by lisabagg. I have been so so so lame about updating the blog lately that I haven't even mentioned Shawn and Finn's joint venture, Robotcha. In short, Finn loves robots and has very specific ideas about the most ideal functions a robot should perform for humans (say, dispense ice cream). 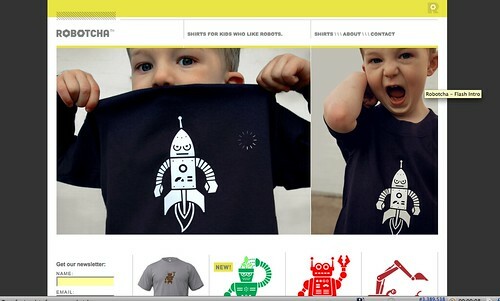 With Finn's ideas and Shawn's talent, they designed a whole range of robot-oriented T-shirts for kids, and adults. They've gotten great response! Rave reviews have appeared on Non-Society, Babble and Rookie Moms, with upcoming reviews on Cool Mom Picks and MomFinds. Check it out! Mommy was outta town for a few days and Finn really stepped up and helped out. 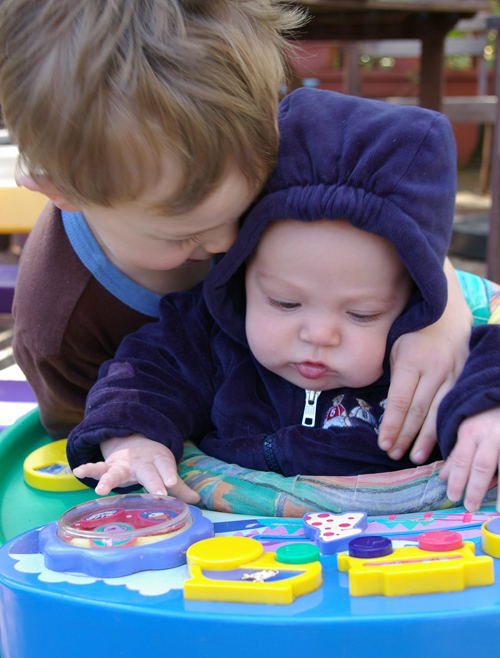 Here he is teaching his little bro to use his new baby chair. flipping from lisa hazen on Vimeo. Dominoes from lisa hazen on Vimeo. finn_drawing1, originally uploaded by lisabagg. 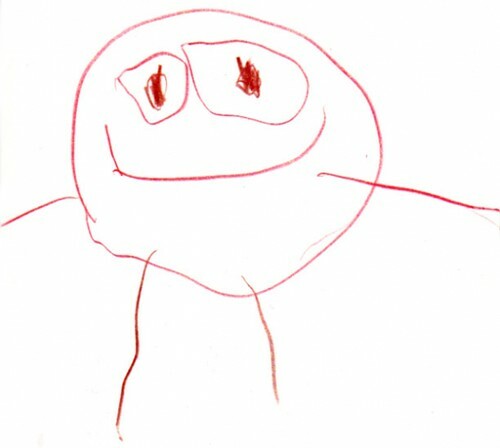 First, here's a drawing by Finn, which he named Chihuahua Lula Bula. Isn't this a good sketch? Following are some of Finn's recent notable quotes. • "Let's play Superhero. I'll be Super Finn, and Cormac can be Diaper Boy." • While walking through the neighborhood, picking dandelions, his friend, Rowan yells out to him, "Hey Finn, what are you getting your Mom for Mother's Day?" He says, "You're looking at it!" • There's a particularly cute girl named Mary in Finn's school who he "secretly" loves. When I'm kissing him goodnight one night, he says, "Mama, can we call kisses 'Marys' from now on?" • FINN: "Mama, where did you get Daddy?" ME: "You mean, where did I meet Daddy? At work." [EDITOR'S NOTE: Thank heavens it wasn't a bar.] FINN: "[pause] Are you teasing? You got Daddy from work?" • [While petting a neighborhood cat we happened upon] "Hello, kitty! Would you like to come home with us? Our dog, Santos, wants a pet, too!" Cormac Laughs from lisa hazen on Vimeo. Nobody--and I mean nobody--can make Cormac laugh like Finn can. The old Three Stooges act of jumping up and down and hitting himself on the cabeza works every time. Right around :30 is when Cormac really starts losing it. Can't you just see these two together when they're older? IMG_0242.JPG, originally uploaded by lisabagg. 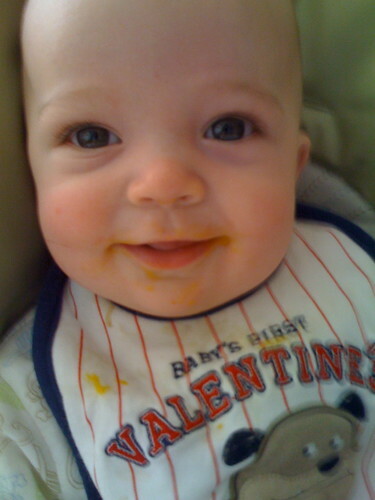 Happy half birthday, Little Cormac!